Electrical fires continue to put human lives, property, and revenue at risk. In my last post we looked at examples of how common and how devastating these events can be. We also looked at how loose and deteriorating connections in electrical switchgear cause a large number of these fires, and how the resulting increase in contact resistance can cause this to happen. To reduce the risk of fires, regulatory bodies require regular thermal surveys, with infrared (IR) thermography being the common method used. As mentioned previously, this method can be very effective but has a few potential shortcomings. For example, a quickly deteriorating connection could be missed if it occurs between scheduled surveys. And the need to access the tight spaces of live equipment with thermal cameras can potentially put technicians at risk of arc flash. Continuous thermal monitoring technology is now emerging, which can offer a safer, more comprehensive, and more cost-effective way to detect thermal risks. Around the globe, many large facilities are already adopting these solutions. For example, a major Facebook data center in Sweden is using thermal monitoring on busways to help avoid the risk of arc flash by providing early alerts of thermal issues. Let’s have a look at how these solutions work. Thermal monitoring is accomplished using individual thermal sensors, which may also offer additional capabilities such as humidity monitoring. These can be permanently installed on MV or LV busbar connections, cable connections, breaker contacts, and transformer inputs, windings, taps, and outputs. If proper safety procedures are followed, sensors can be installed on LV busway without de-energizing. Sensors enable real-time monitoring for abnormal temperature rises and thermal runaways. Systems that incorporate a current level-based temperature model as a reference will also be able to predict busbar temperature and compare it to the actual temperature. This helps unusual temperature rises to be detected more accurately. Sensors embed wireless networking capability, which further simplifies installation. It also eliminates any isolation and insulation issues. Sensors will typically be bus-powered, but may offer a battery option. A facility-wide network of sensors enables automated 24/7 monitoring for any thermal anomalies, without the need for manual inspections and the associated risk to personnel. Data will typically be uploaded to an onsite power management system, or cloud-based repository where it’s accessible by analytic applications. Thermal monitoring systems typically include automated alert capabilities, sending alarms to the mobile devices of operations and maintenance teams to help them respond before any equipment damage occurs. The thermal analytic app can then be used to view real-time and trending data for temperature and humidity by area, equipment, and sensor. Trend data can help predict thermal issues long before they can cause a problem. Phase-to-phase analysis can help further differentiate and isolate a problem, such as one phase of a transformer going into thermal runaway. Cloud-hosted thermal monitoring solutions also enable data sharing with outsourced expert services. These can offload facility teams, offering analytic and advisory services for multiple facilities, as well as supporting conditioned-based maintenance strategies that help improve reliability while reducing costs. When taking into account all of the benefits above, continuous thermal monitoring can offer a significant boost in ROI over traditional IR thermography. In my last post I noted how thermography has been estimated to deliver up to a 4:1 payback, if issues are followed up with timely repairs. In comparison, over a 20-year lifetime, a thermal monitoring solution can deliver up to a 10:1 ROI, when both CAPEX and OPEX are accounted for. Schneider Electric offers a range of thermal monitoring solutions that integrate seamlessly with our EcoStruxure™ Power solutions. 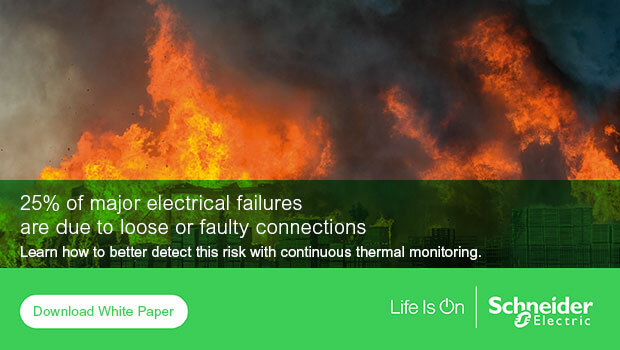 To learn more about thermal monitoring, download the Schneider Electric white paper “How thermal monitoring reduces risk of fire more effectively than IR thermography”.